This shirt was super-cute with its pattern of adorable cartoon sea creatures, but not at all practical. It was a weird terrycloth short-sleeved hoodie that would be way too warm to wear in hot weather, but not warm enough to wear in cold weather. So I took off the sleeves to make it a little more heat friendly and layerable. I still haven't learned the art of taking helpful pictures of my work, but you can find the whole story of this refashion at my blog, The Unfashionista! I. LOVE. THE. PATTERN! So fun and cute! 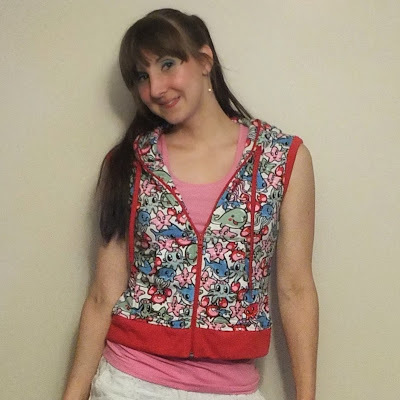 Also, I love the idea of taking off the sleeves to create a stylish vest for layering purposes. Great job.